Years ago I was lucky to have been a staff member for Semester at Sea. Working with college students, sailing the world…..it was an incredible, life changing experience. I got the chance to revisit the motherland since it was one of our port stops and travelled around with my friends from the ship. We stayed at a quaint beach “resort” in the coastal city of Mũi Né to take in all the wonders that Việt Nam had to offer. One night, we had dinner on the lanai with the cool ocean breeze blowing and the sounds of the water lapping on the shore. Just bliss. With our amazingly fresh seafood dinner, my friends and I decided to order Mai Tais. I know….Mai Tais aren’t exactly a cocktail you think of partaking in when you’re in Việt Nam. But hey, the restaurant was also randomly playing the soundtrack to Dirty Dancing throughout dinner—so Mai Tais weren’t exactly too crazy for the scene. It took a long time for our drinks to be brought to our tables but with one sip we completely forgot about the long wait. They were A-M-A-Z-I-N-G! Deliciously fresh in flavor, well balanced, and strong! Who knew I had to travel all the way to Việt Nam to have the BEST Mai Tai of my life! Needless to say, we enjoyed several more throughout our stay in Mũi Né—in fact, they even made a few of them “to go” for us to enjoy during the ride back to Sài Gòn. Seriously. They poured the Mai Tais in plastic bags, stuck a straw in them, and tied them up with rubber bands. Think of “juice pouches”…..but WAY better. My peeps are quite ingenious. (Left) Gail, Joy, and Joe enjoying some Mai Tais. (Right) Kate posing with our Mai Tai pouch. I couldn’t figure out what made their Mai Tais so darn delish until I heard them puréeing something while we were sitting at the bar. Then it hit me…..they were using freshly pressed pineapple juice! DOH! NO WONDER! Tropical fruits in Việt Nam are amazing and the pineapples are no exception. They are so fragrant and sweet. So you can only imagine how incredible a cocktail will be when fresh pineapple juice is used. OH–MY—GAWD. 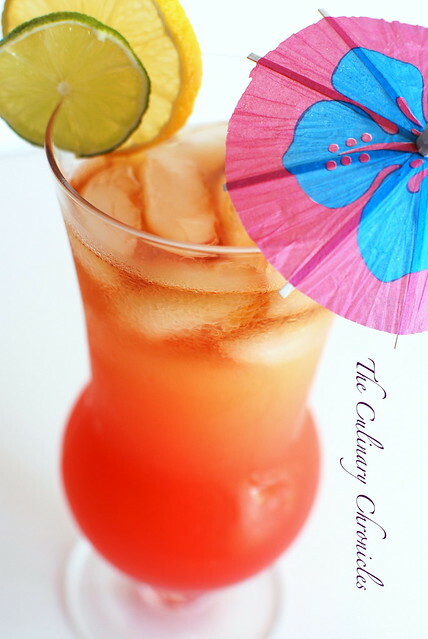 With the rainy weather we’ve been having, I wanted to mix up some Mai Tais to urge on the sunshine. And although I didn’t have pineapples from Việt Nam on hand, I did have some fresh Hawaiian Gold Pineapples that I puréed. 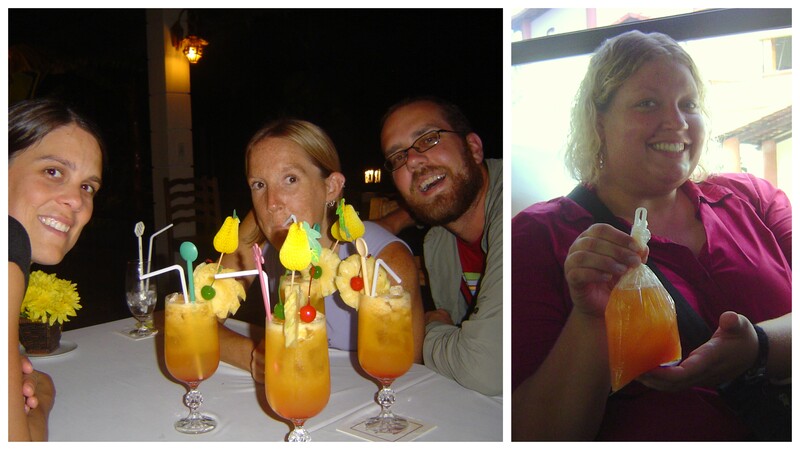 By using fresh pineapple juice and tons of citrus, these Mai Tais were almost as good as the ones back in Mũi Né. And let’s be honest, who doesn’t love sipping on a pretty drink with a paper umbrella in it? Note: The original Mai Tai from the 1940s did not contain pineapple juice……Boy, they sure were missing out! Fill a large cocktail glass with crushed ice. Drizzle grenadine in bottom of the glass. Fill a cocktail shaker with ice. 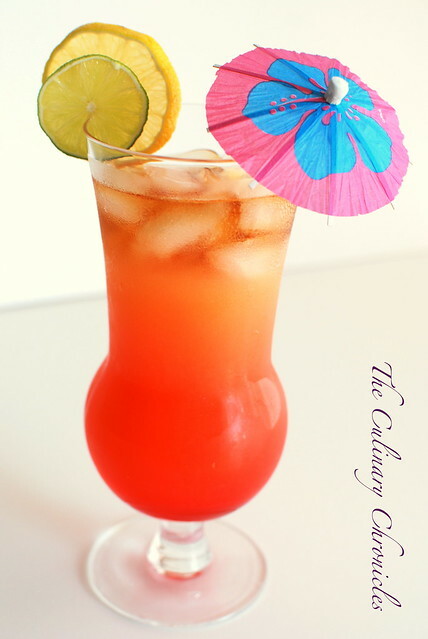 Add pineapple juice, orange juice, light rum, Grand Marnier, lemon juice, and lime juice. Vigorously shake for 10-15 seconds. Hold a large spoon over the grenadine. The spoon should be inside the cocktail glass, against the edge, facing down. Very slowly pour the liquids from the shaker over the back of the spoon allowing it to settle on top of the grenadine. Float the dark rum on top by following the same “spoon method” as described above. Garnish with fruit, straw, and paper umbrella. *To “juice” or press your pineapples, cut the fruit into large chunks. Place them in a blender and puree until liquefied. Strain the liquids to remove any fibers. This looks fabulous,Nam! My best friend is a missionary to Philippines and she always brags about wonderful and cheap fruit there; a key to a fantastic drink like yours!